Happy Meals emerged last year on the Night School label orbiting around the increasingly vital enclave of Glasgow’s Green Door Studios. 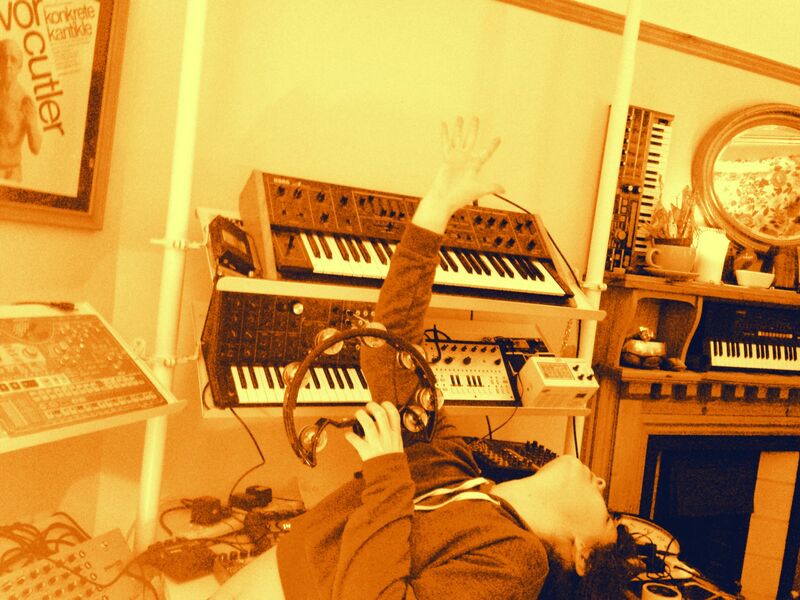 This is our special guide to their home studio, ‘Full Ashram’. There were potent indications of promising expansiveness throughout, with ‘Altered Images’ and ‘Le Voyage’ mixing charming gallic-pop perk with the askew, unstable roils more commonly found in the early experiments of Phuture. Combined with a tendency to air out their work into extensive vistas, as on ‘The Age of Love’ and ‘Visions of Utopia’, altogether it was as complete a debut as you could hope for. In light of such promise, we tapped them up for a feature and they obliged with a special guide to their home studio, ‘Full Ashram’. This is our home and studio. It's very important to us to be able to record in every room of the home whenever inspiration takes us. It's not a big place but it is special to us. The Casio pictured in the above picture was purchased for the reason that it fits the dimensions of our bath perfectly and allows us to both relax and be creative at the same time. Some might say it's a dangerous way to work - but what is art without some risk? We wrote the basic chords and melody for Crystal Salutation in here and recorded the finished take in The Green Door Studio. Food is very important to both of us and so is our kitchen. 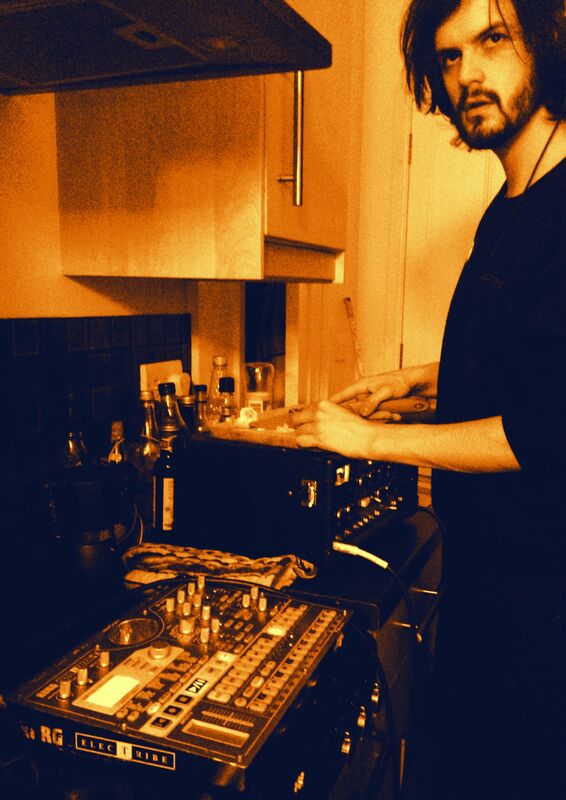 In this picture, Lewis is slicing garlic for a mushroom and pesto pasta bake whilst listening back to a new sequence on the Electribe through the Roland Space Echo. The chopping rattles the spring reverb coils and adds an extra percussive element to the mix. Sounds and tastes pretty good. 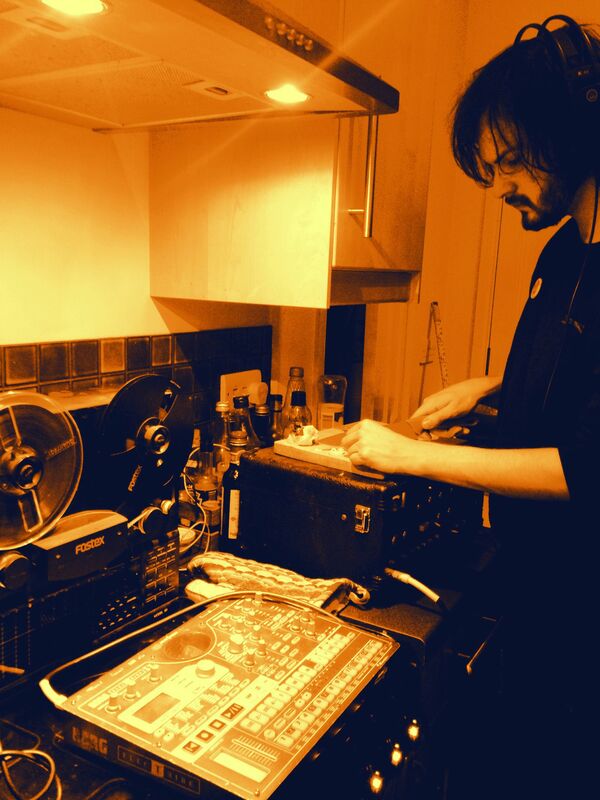 The reel to reel gets brought in to record as the red chilli's are sliced. Suzi listens to a couple of new tracks we've been working on in the living room where the majority of our recording gets done. The x0xb0x provides the bassline whilst the sequencer controls the Vermona DRM and the Korg Delta provides a sustained drone. Sometimes writing music is easiest when you're really tired and your mind is floating. 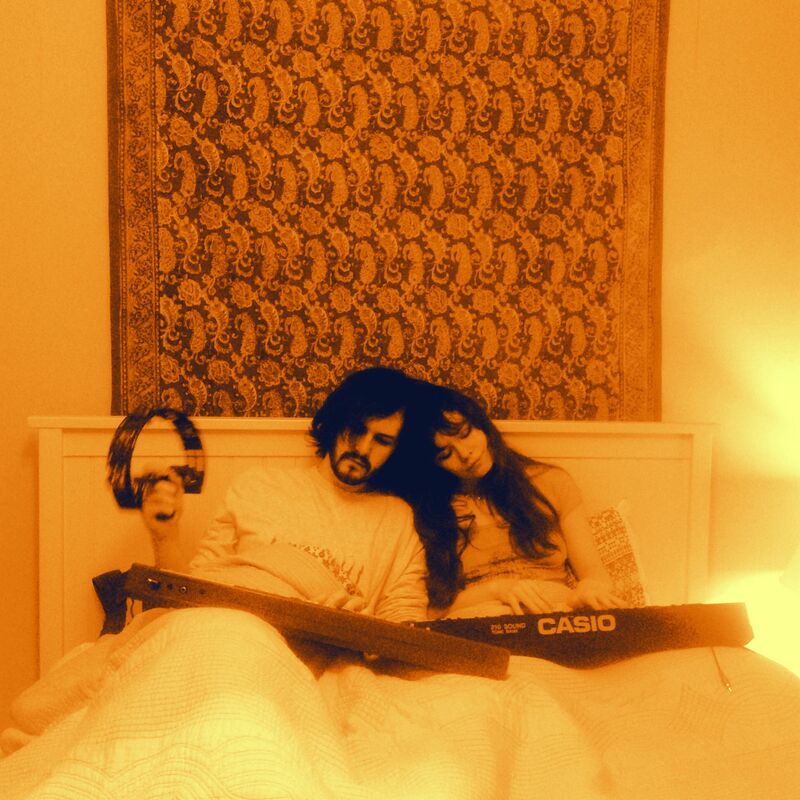 We recorded Visions of Utopia entirely in bed using just the MS20, flanger and delay pedals, and Suzi's voice. 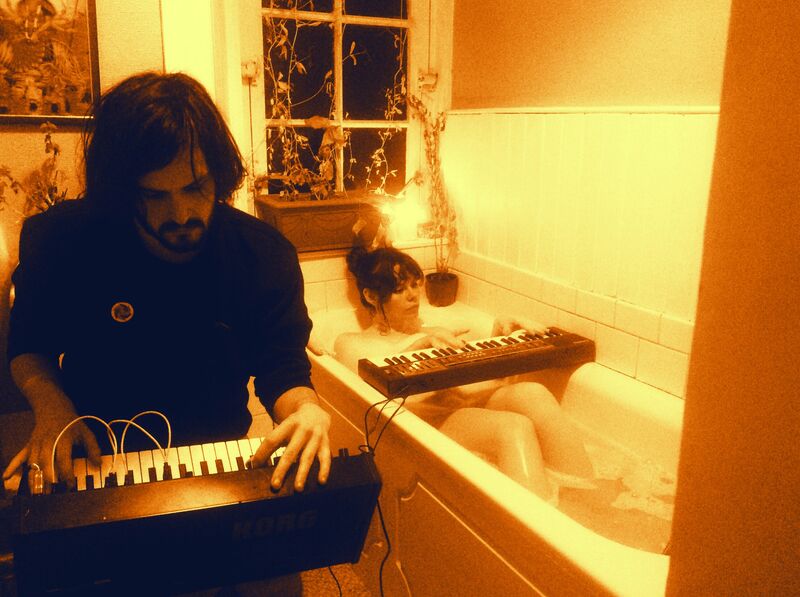 Here we just posed with a couple of synths plugged in, but this actually turned into a pretty cool jam in the end that I wish we'd recorded. More on Happy Meals on Night School's site.